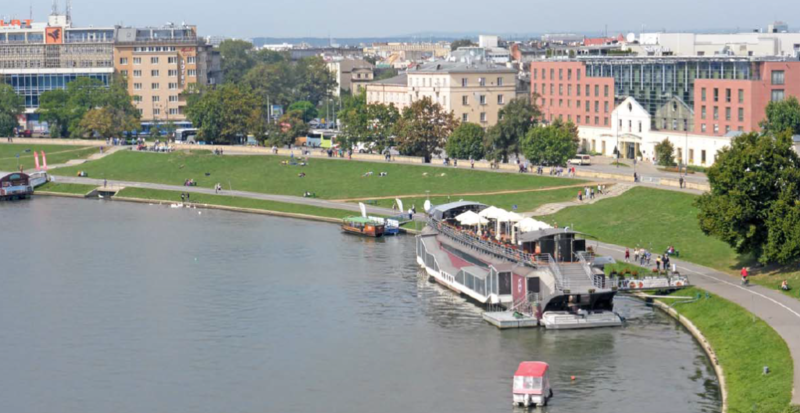 While Warsaw is stiff and formal, business and politics, Krakow is laidback and friendly, colleges and culture. Warsaw is vertical with tall buildings and grand avenues full of traffic; Krakow is horizontal. 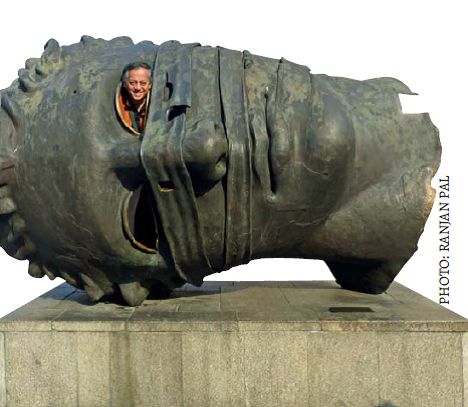 RANJAN PAL savours a unique ‘poles apart’ experience. I look down at the remaining pierogi (Polish dumpling) on my plate and ponder whether to spear it. Sitting outside the Zapiecek restaurant on the main strip of Nowy Siat, the nightlife on the streets is beginning to pick up. Next to me the dark-haired Polish guy is wolfing down the last of his kaszanska (blood sausage). He notices me looking at his plate and we strike up a conversation. Turns out that Nima is actually German but of Iranian extraction while his friend Florian looks more Teutonic. Like me they have just arrived in Warsaw but from just across the border, the Polish capital being an overnight train ride from Hamburg. Having downed several bottles of Tyskie lager, my new friends and I stumble tipsily down Nowy Siat looking for some action. Eventually we find it on Mazowiecka Street where the trendy nightclub Enklawa is drawing the beautiful young people like a magnet. I don’t fall into either category but the bouncer lets me in anyway, maybe he doesn’t get to see many Indian punters. Inside, the club is alive with wildly gyrating bodies and we are seriously impressed with the Polish female talent on display. Unfortunately the jet lag and the alcohol have begun to catch up with me and I fall asleep on a couch near a group of PYTs. I am shaken awake and find myself being unceremoniously deposited on the pavement outside. Wearily I flag down a taxi and make it back to my friend Ajay Bisaria’s home by 4 am, add being thrown out of a Polish nightclub to my list of lifetime achievements! By day, Warsaw is a big impersonal city with tall Soviet-style buildings that block out the sun. The tallest of them is the Palace of Science and Culture which is to Warsaw what the Empire State building is to New York. Originally built in the early 1950s as a gift from the Soviet people, it survived the fall of the Soviet Union though the name of its benefactor Stalin was summarily removed. I ride the elevator to the 30th floor on a Sunday morning hemmed in by chattering Polish tiny tots and their doting parents. Most of the viewing terrace has been given over to a free arts and crafts centre and the splashes of bright colour light up the sombre interiors of the palace. 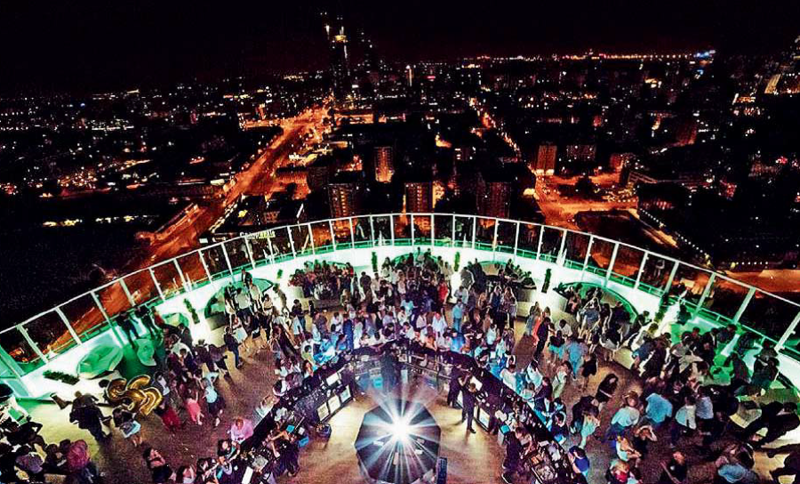 Later that night the view is even better from The View, Warsaw’s most happening rooftop nightclub and I’m not just referring to the city. The people-watching is amazing as glitterati, celebs and business tycoons, all crowd around the iconic circular bar. Nima and I try to look the part in our trendy leather jackets as we sip at our dirty martinis but I don’t think we have successfully cultivated the I’m-so-bored-but-I’m-so-rich look. Paradoxically this draws the attention of a stunning tall brunette called Maya who speaks with a definite American twang. Turns out she is originally from Minnesota, has lived in Warsaw for half her life, hates Polish men and is clearly looking for a hook-up. The evening has suddenly got a lot more interesting! It also helps demonstrate the elemental truth that if you are with one beautiful woman at a bar then it serves as a positive signal to others. We succeed in chatting up two striking blondes visiting from Frankfurt and for a giddy moment Nima and I are the envy of all the other men in the place as we manoeuvre our companions on to the dance floor. We do our best to persuade the babes to hit Enklawa but the Germans have an early morning flight home and so we settle for an exchange of digits and a promise to reconnect someday sometime. Somehow I’ve taken Nima under my wing and we have become fast friends and comrades-in-arms all in the space of 24 hours! Warsaw. Quite literally because after his death in Paris, this life-giving organ was carried back to his native home and interred in a pillar of the Holy Cross church. His name is everywhere from the international airport to a popular brand of high end vodka though there is no evidence that he was fond of the stuff. I decide to remedy matters by raising a vodka toast to the great man while sitting on a bench in front of his statue in Lazienki Park. It is a Sunday afternoon and the crowds are gathering for the free Chopin concert performed by specially invited pianists from around the world. Today it is an attractive local musician called Monika Rosca who has the audience’s attention as she launches into the Polonaise in A Major, one of his most famous compositions. The airy notes of this beautiful piece waft out into the evening air and the audience listens in rapt silence. My eyes are closed and I feel as if I have been transported into another world— maybe even the Paris salon of George Sand, a French Romantic novelist and Chopin’s lover in the years before he fell terminally ill.
On my last weekend in Warsaw, my host Ajay, who is our Ambassador to Poland, returns from an extended trip around the country and we spend a few hours catching up in his beautiful mansion over several glasses of Chopin. Jokingly I assure him that I have done nothing that would bring disrepute upon him or our great country — plausible deniability being the name of the game. We are great friends and he laughs uproariously at the suggestion. He is laughing considerably less later that afternoon as I match him stroke for stroke on the fairways of the First Warsaw Golf and Country Club. Ajay is a far better player than me but beginner’s luck is on my side and I play an unexpectedly good round! Ajay is also a man after my own heart which translates into enjoying the finer things in life and that evening he takes me to the strangely named Pardon To Tu billed as Warsaw’s finest jazz bar. The Swedish group Fire! are in full swing and the place is packed with standing room only. We squeeze our way through to the bar and Tyskies firmly in hand, watch the group side on as they jam in front of a backdrop which has the name of every known musician from Chopin to CCR to Coldplay, the epitome of cool. The evening ends back on Nowy Siat at the garishly decorated but extremely popular Bollywood Lounge, a Polish sheesha fantasy of what India is like. Ajay has invited a group of Polish diplomats and IKEA executives to celebrate a three-way deal which will have Polish furniture makers manufacture in India and channel their product to Sweden for further processing. In exchange, IKEA will have greater access to the Indian market…truly a win-win-win for all. The Indian food is quite average but everyone is in good spirits and the booze is flowing quite liberally. I sit next to the affable IKEA senior guy and it turns out that he is based in Gurgaon, ten minutes from where I live. Talk about a really small world. the second city of Poland, is about as different from Warsaw as chalk from cheese. They also exhibit a rivalry which matches other great pairs in the world: New York and DC, Sydney and Melbourne, Mumbai and Delhi. While Warsaw is stiff and formal, business and politics; Krakow is laidback and friendly, colleges and culture. Warsaw is vertical with tall buildings and grand avenues full of traffic; Krakow is horizontal with a sprawl of brick and slate roofs clearly visible from its spiritual and physical heart Wawel Castle. I am met by my guide Bruno as I disembark from the PKP Intercity express at Krakow station. He is instantly likeable with a boyish smile and a roguish charm that I am sure makes him a big success with all the ladies. Our destination is Zakopane, a mountain town which is the takeoff point for the Tatras and a couple of hours drive due south. After lunch, Bruno takes me for a stroll through the town but I find it a little too touristy and full of kitsch. We unwind in the heated pool and jacuzzi at the luxurious Aries hotel hoping for better company but finding only old German pensioners. Even the pretty PR manager Kascia politely but firmly rebuffs our suggestion that she try out the facilities in the line of duty. As adventure travel is my passion, I had specially requested a trip up to see Morskie Oko (meaning Eye of The Sea) a beautiful lake nestled in the heart of the Tatra mountains. However, this morning the weather has turned against us and we trudge up the asphalt path in halting rain, chilled to the bone by the freezing wind. I am amazed at the number of Poles who are making the same pilgrimage, some even pushing toddlers in prams — the whole experience is a world away from the solitary trails I am used to in the high Himalayas. Finally we reach the lake and even with the lowering cloud which obscures the high peaks that surround it, one can see that it is quite a magnificent sight. A few photos and a couple of massively overpriced coffees later in the solitary chalet and we are on our way down, this time opting for the horse-drawn cart which carries us down at a rapid clip. Back at Krakow, I am handed over to my new guide Darek who seems as different to Bruno as Warsaw from Krakow. Older, heavier, more plodding and pedantic, he is a stark contrast to Bruno’s twinkling charm and engaging banter. Still Darek is a complete professional and his knowledge of Krakow is considerable as I am to find out over the next two days. Wawel Castle dates back to the 10th century and the cathedral is a hodgepodge of architectural styles imposed by successive rulers — it looks like something a child might have slapped together. However the numerous staterooms and royal chambers are richly appointed and under Nazi occupation, Governor General Hans Frank made it his home, knowing a good thing when he saw one. That decision alone saved Krakow from the awful fate that befell Warsaw of being bombed and razed to the ground, so the city appears much as it did in medieval times. 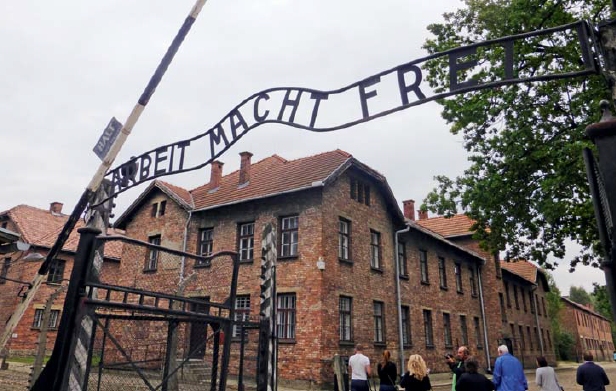 The one thing that remains seared into my memory from my stay in Krakow is my visit to Auschwitz-Birkenau. It is an appropriately gray and overcast day when we reach the largest concentration and death camp ever built by the Nazis, just an hour’s drive from Krakow. One has heard so much about the horror of these places but nothing quite prepares you for it. I stop at the entrance and look up at the words Arbeit Macht Frei (Work Will Set You Free) wrought into the metalwork of the entry gate. The Jews that entered thought it might mean some small chance of survival. The Nazis knew otherwise: in a grotesque parody, it meant that the Jews would be worked to death and thus set free from life. I feel a cold shudder run down my spine; it is hard to tear my eyes away from these chilling words, frozen in metal against the sky. The hours that follow feel almost interminable and their impact on my emotions is wrenching. There’s a massive glass chamber full of human hair shaved from the Jewish victims. The black wall where political prisoners were executed with a shot to the back of the neck. The iron rail from which eleven prisoners were hung as a reprisal for others who escaped. The cruel narrow cells where prisoners were made to stand for 72 hours as punishment. And, finally, the gas chambers where the Jews met their final solution, all the time thinking they were being sent in for a hot shower. In the lowering dusk, my guide David and I walk back the length of the Birkenau death camp in total silence. Behind us is the International Monument which marks the murder of 1.5 million people, almost all Jews, with an inscription translated into 24 languages for all the countries the victims came from. The train wagon that transported Hungarian Jews to Auschwitz stands alone at the end of the railway line which enters the camp, a forlorn reminder of the horrors of this place of suffering and death. I look at the date and notice with a shock that it is September 11, a day to remember the slaughter of innocents. I know I will never forget this afternoon as long as I live. It is Saturday night, my last in Poland, and Krakow has the reputation for being the most rocking party town in Poland, if not in Central Europe. Horses for courses, I quickly ditch Darek and hook up with Bruno for the evening. 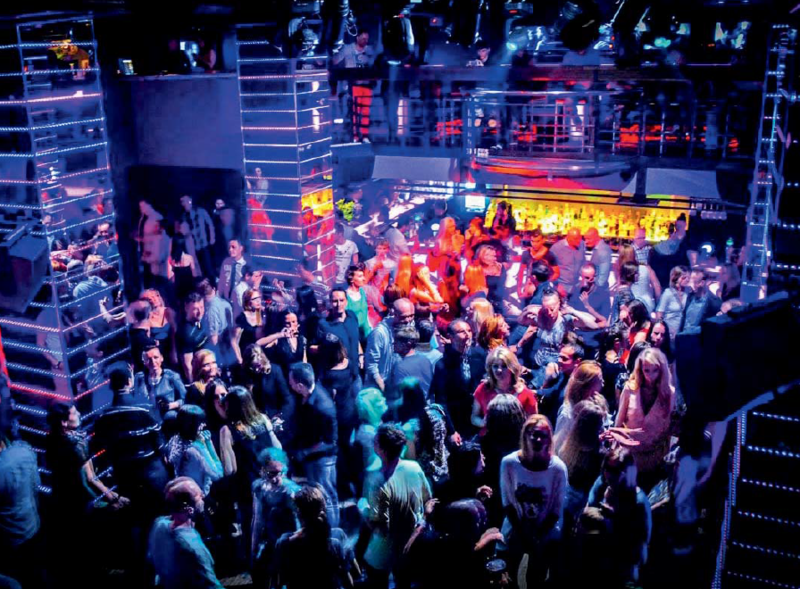 We start out at Teatro Cubano, one of the hottest new places on the Krakow clubbing circuit. Bruno has invited his neighbours Eva (a lively blonde who could pass for Reese Witherspoon) and her banker husband Jarek. 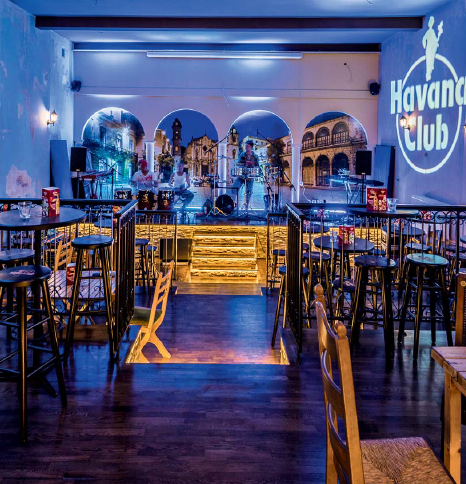 The ambience is all Havana with Cuban flags and symbols and even laundry hanging from the balconies above and the salsa beat is compelling. Several mojitos later, we stagger out on to Jagielloska Street and my new Polish friends head for Stalowe Magnolie (Steel Magnolias), a well-known dance club a stone’s throw from the Barbican. This is one of the advantages of clubbing in Krakow. You can walk everywhere and so no worries about driving home drunk. 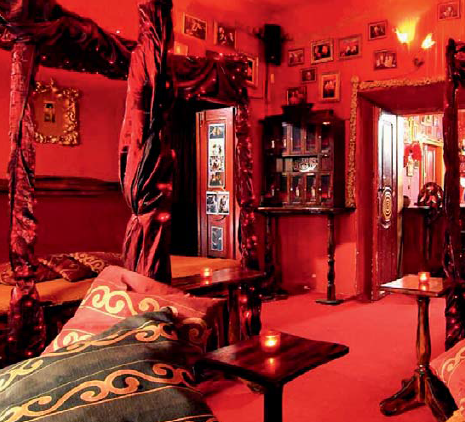 The club is an amazing place, all decked out in opulent red velvet with low lighting so that you feel like you are entering an Aladdin’s Cave. But the best part is the live music and a local band is belting out Smoke on the Water which gets us all out on the small dance floor. Eva is dancing with me and my theory about the Rules of Attraction proves right again. But that’s another story and now my Polish adventure is done!